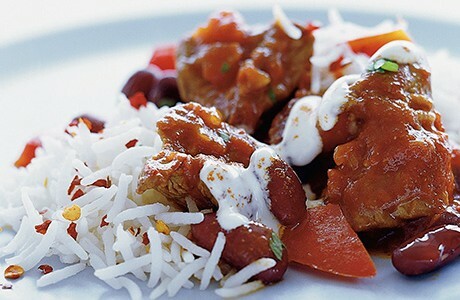 This quick and easy recipe uses chunky lamb and a variety of spices along with tender red kidney beans. Light and fluffy Basmati rice is the perfect partner for this hearty, family style chilli. For the chilli, heat the oil in a medium saucepan over a low heat. Add the onion and garlic and fry for 10 minutes until soft, then add the red chilli, red pepper, ground cumin and chilli powder and stir-fry for 3-4 minutes. Turn the heat up to high, add the lamb and stir-fry for 5-6 minutes, or until the lamb is browned. Meanwhile, for the rice, add the rice and chilli flakes to a large pan of boiling water and cook following the instruction on the pack. To serve, spoon the rice and chunky chilli on to warmed serving plates. Top with a spoonful of soured cream, if desired, and serve immediately.